If you happen to be actively involved in bodybuilding, or even simply involved in working out regularly in order to try and bulk up slightly, you’ll know that building muscle is about far, far more than simply just lifting weights in the gym. In reality, building muscle is very much dependent upon the foods you consume on a daily basis. Even going into further detail, however, not only is it dependent upon what you eat, it’s also dependent upon the times you eat and the frequency of your meals. When we think of foods that help build muscle, we think of protein, and for good reason as protein is indeed essential for muscle growth. Another micronutrient however, which is often overlooked and sometimes gets a pretty unfair negative reputation, is the humble carb, in the form of carbohydrates. When it comes to the consumption of carbohydrates, they can also play a crucial role in the formation of lean muscle mass, for a variety of different reasons. 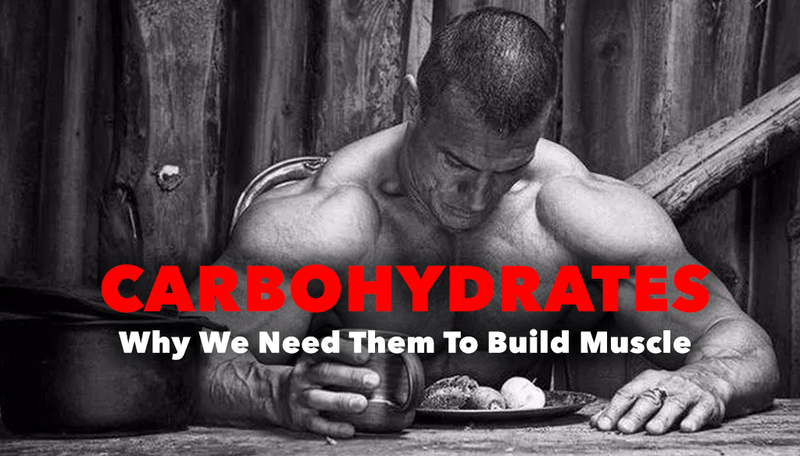 Here are a few benefits of carbohydrates, plus a look at why we need them to build muscle. When we think of carbohydrates, there are actually two different forms: simple carbs, and complex carbs. Simple carbs are considered far unhealthier because they’re molecularly different in structure to complex carbs as they’re found in more sugary foods, which can affect blood sugar levels and insulin secretion. Complex carbohydrates take longer to break down and are found unhealthier sources such as breads, rice, pasta, and potatoes. However, simple carbs when consumed with a post-workout shake are absolutely essential for muscle growth, because they do cause a spike in insulin. After we work out, or muscles are depleted of energy and nutrients, which are essential for growth and repair. We drink post-workout protein shakes to help get nutrients back into the muscles. Insulin, however, acts as a transportation system for these nutrients and basically shuttles more nutrients into the muscles as quickly as possible, when they are most anabolically primed to absorb more of them. Many bodybuilders will add a scoop of dextrose, sugar powder to their protein shakes to assist with absorption, which then leads to that essentialpost-workout insulin spike. If you’ve ever been carb depleted or have followed a low-carb diet, you’ll know immediately just how awful it makes you feel, both physically and mentally. Recent studies, however, have revealed that carbohydrates are able to promote the secretion of serotonin, a hormone which plays a key role in mood. Put simply, the more serotonin we have in our systems, happier, more relaxed, and more focussed we feel as a result. One of the main key benefits of carbohydrates, however, is the fact that they play such an essential role in energy production within the body. That is actually the primary purpose of carbohydrates, which is why glucose sugar is the body’s primary energy source. The main thing to remember, however, is that complex carbohydrates, are generally speaking the much better sources, because they’re digested, broken down, and absorbed far slower, so they release a slow and steady release of energy into your body. Simple carbs such as sugar and sugary foods, are absorbed and digested much quicker and so the energy is quickly used up and can result in a “sugar crash” which makes you feel tired and lethargic. From a bodybuilding standpoint, carbohydrates are essential as without them you simply wouldn’t have the energy to power your way through your workouts, and as you know, many bodybuilding/muscle building workout programs are extremely physically taxing so having enough energy to get through them is vital for so many different reasons. Carbohydrates are naturally high in calories, because they’re so rich in energy, so obviously if we consume too many we will gain weight. If, however, we track our calories and ensure they fit our daily macros, carbohydrates, well, complex carbohydrates, can help us to not only maintain our weight, but to also lose weight as well. One of the main reasons for this is that pretty much all complex carbohydrate sources, oatmeal for example, are rich in dietary fiber, both soluble and insoluble. The soluble fiber is especially beneficial because once consumed, it breaks down slowly in natural waters within the stomach and forms a thick paste, similar in consistency to wallpaper paste. This paste coats the lining of the stomach and digestive tract and swells slightly, expanding and fooling the stomach into thinking it’s fuller than it is. This means that we feel full for much longer and so our appetites are suppressed and so we consume less calories as a result. Not only that, but we also get less cravings for unhealthy junk foods which not only means we’re less likely to cheat on our diets, but that we also don’t have to put ourselves through hell whilst dieting down, perhaps for a photo shoot or bodybuilding competition.